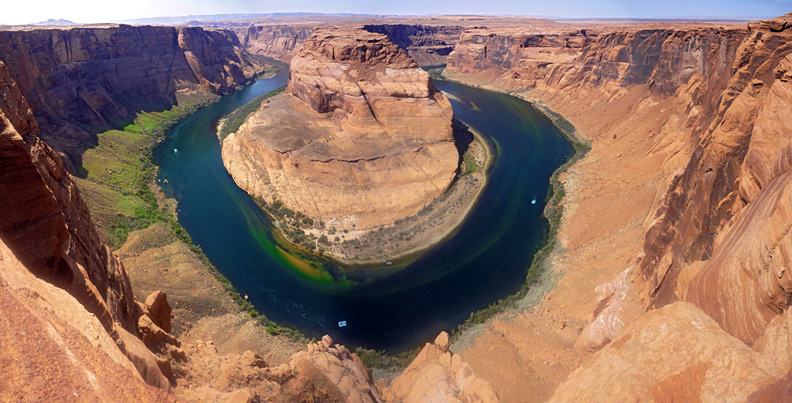 As most of Glen Canyon is submerged beneath Lake Powell, the only intact section is downstream of the dam, where the Colorado River flows through the 1,000 foot deep ravine for 15 miles, until the cliffs open out at Lees Ferry. 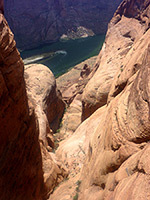 Apart from viewpoints around the US 89 bridge and the dam itself, the canyon can be seen via two trails - the lightly used and rather strenuous Spencer Trail starting at Lees Ferry or the much easier and very popular half mile path to Horseshoe Bend Overlook, where the river curves round by 270 degrees. 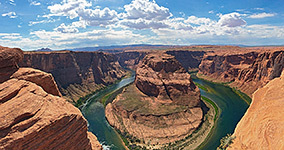 This is one of the most spectacular and oft-photographed places in Arizona, though to capture the full extent of the scene (a horizontal field of view of about 90°) needs either a fisheye lens or merging of three or four regular photos, in portrait orientation. Becuase of increasing visitation, and concerns about safety, a metal fence was constructed at the viewpoint during winter 2017/2018, accompanied by trail upgrades and two shaded benches. Visitors may still experience unfenced views, hovever, by walking a little further along the rim. The overlook at Horseshoe Bend is served by a large parking area on the west side of US 89, five miles south of Glen Canyon Dam; big enough to accommodate the tour buses that often stop here, though increasing popularity often means that all spaces are taken by late morning. Posts were installed on nearby verges in summer 2018, preventing any overflow parking. 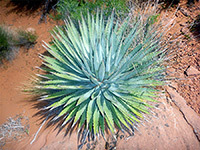 The adjacent land, and the viewpoint, are actually just south of the Glen Canyon NRA boundary, on the Navajo Reservation, but the trail is managed by the NPS. The wide path climbs a little to a low, flat-topped hill then descends gently down the far side, across a mix of slickrock and dunes to the unfenced overlook, on the rim of cliffs that are quite sheer for most of the 1,100 foot drop to the river below. 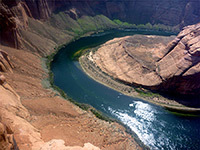 The water in the Colorado is slow moving, greenish blue in color and edged by thin strips of bright green vegetation - a striking contrast to the red-brown Navajo sandstone cliffs at either side. There are often several rafts and boats in view, making the short upstream journey from Lees Ferry; sandbanks and bushy areas along the river provide many stopping places. Slightly better, more elevated views can be had by climbing a small knoll just north of the main overlook, while walking either direction along the rim gives a different perspective of the scene. 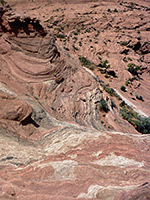 One other feature of interest in the vicinity is a short but very deep tributary ravine (Ninemile Draw) to the northwest, reached by a one mile walk over the slickrock plateau, which is fairly level, formed of fractured, angled sandstone strata, heavily eroded into small cliffs, mounds and gullies. 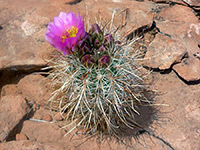 An interesting selection of wildflowers and desert plants grow in crevices and around potholes, including Utah agave, echinocereus coccineus and the less common sclerocactus parviflorus.